Welcome to our monthly special feature post, Bookstagrammer Of The Month! 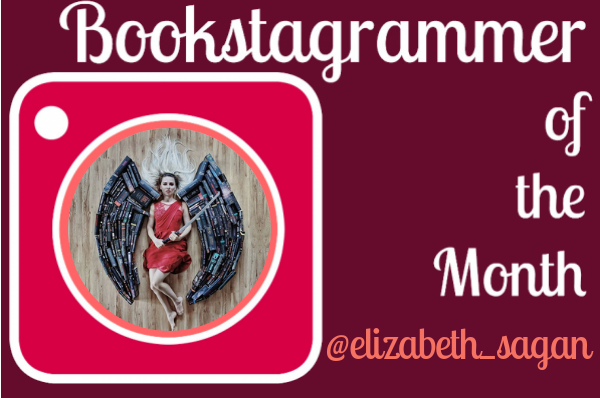 Introducing Elizabeth of @elizabeth_sagan, YABC's Bookstagrammer of the Month!! Co-founder of @mybookfeatures. Finished Law School in February and took a few months off to focus on a project. How long have you been part of the Bookstagram community? I started my bookstagram account at the beginning of 2016, so it’s been almost 3 years. Can you tell us a bit about your feed/style and how it has changed over time? At first my feed was really simple – I only took pics of the book covers (I actually deleted a good amount of those first pics, aprox. 300 haha). In summer 2017 I started incorporating my face and body in my pics and this was the moment my account really started to grow. It’s funny that sometimes I’m looking back at those first pics and I remember thinking that what I was doing then was difficult. What is the silliest thing you've ever done for the sake of a photo? I unknowingly sat on an anthill, wondering why am I feeling so many stings on my thighs. Another time James and I went into the forest with 2 bags full of books and tried to take pics... however, it was summer and it was FULL of mosquitoes. And when I’m saying FULL, I’m saying that while he was taking the pics, I was fanning with a shirt around me and him to shoo the mosquitos. It got so bad that we had to go back home almost running. When do you make time for taking photos? Do you usually plan ahead or take photos as you go? I’m taking my pics in batches. Every month I’m going to James Trevino’s place and for a whole week we’re taking pics. A batch usually translated to 16-20 pics that last for another month. So they are obviously planned – I’m a big fan of journaling and I’m writing my ideas in my notebook – they are usually poorly drawn sketches (they are so bad it’s not even funny). But hey, at least the pics look good! What are some of your favorite props (besides books, of course ;) )? Pretty dresses and, as of lately, colourful backgrounds. I would like to have more props, for example, I would like to be able to do cosplays of different characters, but that would be pretty expensive. Maybe one day. What books/series do you tend to photograph the most? Fantasy books, since there are a lot of them on James’ shelves. What book color do you wish you had more of in your shelves for photography? We need more yellow/orange spines! Especially yellow. I actually brought from my house every book that has yellow/orange spine and there are still too few! Which of your photos is your absolute favorite and why? What is the thing you love most about Bookstagramming? I love the fact that I’m keeping an eye on the publishing industry – Bookstagram is the place where I find my next read, what books are trendy, which author is popular now and so on, and it’s how I discovered a lot of great books and authors. I really wouldn’t know where to look if Bookstagram would suddenly disappear. I don’t watch Booktube (maybe I should), and Goodreads doesn’t do it for me – I’m only using it to keep track of my reads and to check other people’s reviews of the books that I’m interested in, but it’s not really a place for book recommendations like Bookstagram is. What are a few of your favorite Bookstagram accounts? Aside from @james_trevino who doesn’t count haha, @bookishbronte is my numero uno favourite account. @thomreads is also a great inspiration, I wish I knew about him when I started college – he would have motivated me to learn big time. Do you have any tips for new Bookstagram accounts that you wish you knew when you started? The tips that I wish I knew when I started bookstagramming wouldn’t work now haha. Things changed a lot, starting with the moment when the feed stopped being chronological. My tips depend on the reason you are on Bookstagram. If you want to keep in touch with the new books and want to share your reads, in other words, if this is a hobby, then keep it as a hobby. The moment you start to get stressed and feel like social media starts getting too much (and it happens more than you might think), take a break. Lastly, what are you currently reading and what has been your favorite read this year so far? I’m currently reading Queen of Shadows by Sarah J. Maas and OH MY GOD! After 2 pretty average books, this series really took off and I’m stealing every moment I can to read a few more pages! As for my favourite read this year, it actually is the first book that I’ve read in 2018 – The Passage by Justin Cronin. It was a really good start. Wednesday, 19 December 2018 Bookstagram Accounts We Love! Wednesday, 21 November 2018 Bookstagrammer of the Month: Silvana of @siilbookishpastrychef! Wednesday, 17 October 2018 Bookstagrammer of the Month: Elizabeth from @elizabeth_sagan! Wednesday, 19 September 2018 Bookstagrammer of the Month: Isabel of @pagesofisabel! Bookstagrammer of the Month: Cait of @paperfury! Bookstagrammer of the Month: Erin of @erinsummerill! Bookstagrammer of the Month: Isabel of @pagesofisabel!